I was born and raised in Marquette and graduated from MSHS. I received my bachelor of science degree at Western Michigan University and Doctor of Veterinary Medicine (DVM) degree at Michigan State University. 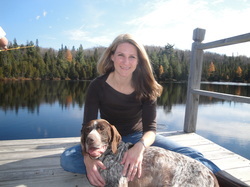 After graduation, I practiced 14 years in Detroit, Lansing, and Marquette veterinary clinics. My experience in small animal veterinary clinics includes general medicine, emergency medicine, internal medicine, and soft tissue surgery, and orthopedic surgery. I left clinical practice in 2013, in order to find balance with my career, family, and love of animals. Within a few months of exploring different options, I found that a house call practice would be something that my patients, clients and myself would love to have. As of September 2017, I've specialized my services to in-home euthanasia and cremation services only. This is something that I feel is very important to provide our pets. The pets are much more peaceful and comfortable in their own homes, surrounded by their favorite people and housemates.